Bialecki Architect’s sustainable designs strive to integrate the architectural expression with the local ecology of a site. Our work uses as its foundation the three most critical aspects of sustainable buildings: a high performance “building envelope” (floors/walls/roof), state-of-the-art, high-efficiency building systems, and a minimally-invasive site design. In short, a better box with a high-efficiency engine parked lightly on the landscape. BA utilizes the most advanced techniques and materials available for sustainable high efficiency construction, including recycled and renewable materials, high-performance glazing, high-efficiency spray foam insulation, “rainscreen” vented walls, and BA’s trademarked “Umbrella Roof” system for passive cooling and healthy air quality. BA considers many factors before choosing heating, ventilating and air conditioning (HVAC) systems. Building type, user requirements, site considerations and budget are all key factors in the selection of the most energy efficient HVAC system. BA’s preferred systems include hydronic radiant heating systems embedded into high-mass concrete flooring, Heat Recovery Ventilators (HRV’s) or the latest generation of Air to Air Heat Pumps. The hydronic radiant systems can be powered by either geo-thermal heat pump systems or high efficiency self condensing propane boilers. Coupled with computer-controlled outdoor thermostatic controls, the systems deliver the precise energy load to the radiant floor. In conjunction with the radiant heating systems, HRV’s maintain air quality without compromising energy efficiency. 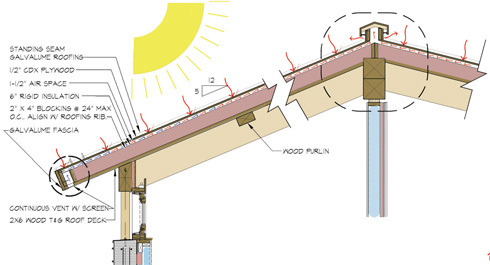 Cooling in our sustainable buildings is passive, using a central stair thermo-siphon and whole house fans to vent warm air out of the building. BA buildings are designed to be comfortable without air-conditioning, relying on our siting, building envelope design, and passive cooling and ventilation to provide user comfort. However, we recognize that their are many occupancies (assembly) and performance requirements (low humidity) and technical needs (constant temperature) that require conditioning the air. When required we find the minimal amount of conditioning and the most efficient systems. At Bialecki Architects we analyze every aspect of the building’s design to ensure comfort and affordability while producing buildings that meet a LEED Silver baseline energy use. What makes BA’s designs truly unique, however, is that they are analogs of the surrounding environment, using materials and forms directly from the landscape to realize a “constructed landscape,” the architecture as a garden, and the garden as a building. Natural materials for flooring, walls and structural framing pass seamlessly from interior to exterior, helping to dissolve the normal boundaries between site and structure. We see the landscape as a series of spaces, the “rooms” of nature, with the structures becoming another space in that continuous garden. The entire experience is one where nature is experienced directly, everyday throughout the entire building. Named for its inherent shading qualities, the Umbrella Roof is designed to dissipate summer heat gain and passively cool the structure. It accomplishes this via a unique layered system of high-performance insulation with a aluminum cloth radiant barrier under recycled metal roof panels. 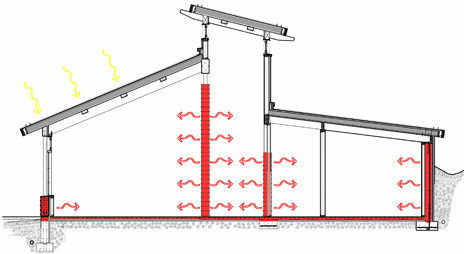 The vented air space between the radiant barrier and the roof panels naturally convects the unwanted heat gain to the exterior and away from the building. The system was awarded an AIA Sustainable Design Award for it’s use at the Sam’s Point Conservation Center. This trademark system is another example of our commitment to innovation and efficiency in sustainable design. A high-efficiency hydronic radiant heating system circulates warm water through hundreds of tubes beneath the floor. 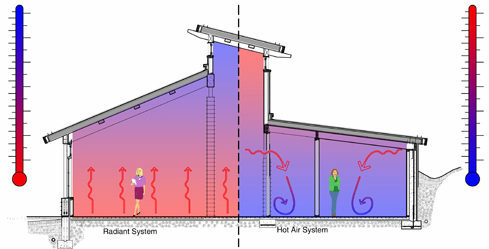 Unlike hot air or convective systems, the radiant system does not attempt to heat the entire volume of air in the space. It warms the user directly. Heat is focused where you need it, at the lower room levels, and not at the ceiling. Geo-Thermal heat pumps or high efficiency gas boilers are both good heating sources for radiant systems. The inclusion of a thermo-siphon allows cool, prevailing winds to ventilate a building naturally during the warm summer months. 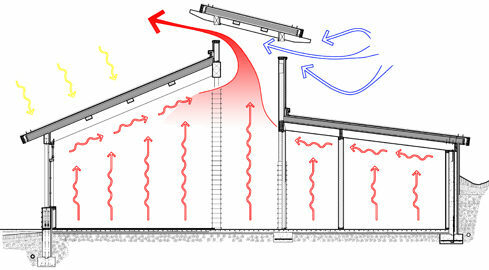 Warm air rises up and out through windows in a tall, central monitor, often integrated into a stairway or tower. See the Null-Thaler Residence, Breen-Priddle Residence and the Sam’s Point Conservation Center for examples of this design. Bialecki Architects strives to include in its designs large stone and masonry features to absorb and store heat from the radiant systems and passive heating elements. Where the site allows, we partially bury the building in the landscape with natural earth berms or excavations. Earth berming provides natural insulation, temperature modulation and thermal mass energy storage at low cost. See the Sam’s Point Conservation Center, 10 Bridge Creek Road, Null-Thaler Residence and the Cook Residence as examples of this technique.